Since the MMLC has been in the Library, we’ve really been taking advantage of our proximity to our peers. I thought I would start a blog series called “Putting IT To Use” about how a language professor or other Humanists could incorporate some of the new (or at least new to you!) technology Northwestern has. First up is the One Button Studio (OBS), which is similar to the Lightboard studio in practice. A lot of units will most likely talk about these two studios in terms of how you can shoot segments to use in MOOCs or flipping/blending/hybridizing your courses. And they’d be right! It’s easy to use – all you need is a thumbdrive (oh and BTDubs did you know the MMLC has thumbdrives available for check out?) to save your recordings onto. Humanities and Computer Science — What? In what will hopefully become a recurring feature for the MMLC blog, our pet cats (and our colleagues’ pet cats) test out the equipment that the MMLC has available for checkout. If you have a tech-leaning Northwestern-affiliated cat who would like to become part of our team, please feel free to shoot me a message in the comments. 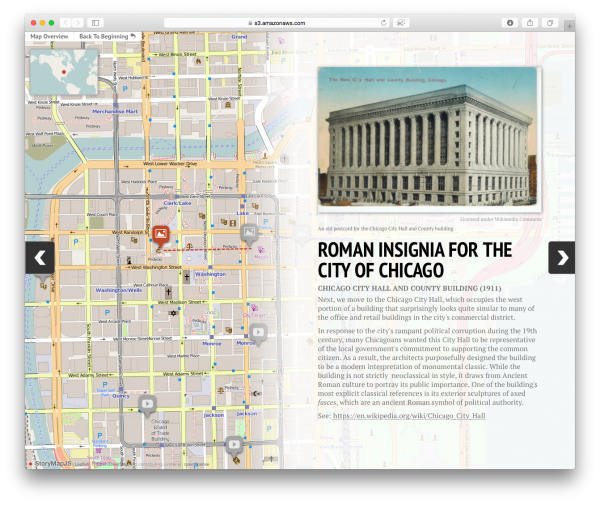 Students of a recent course taught by Classics Professor Francesca Tataranni titled “Ancient Rome in Chicago” have completed an impressive virtual walking tour that explores how the city showcases its engagement with the classical past through its streets, buildings, and monuments. A student-produced virtual walking tour highlights ways in which the classical world is memorialized in Chicago. The virtual tour uses StoryMapJS from the Northwestern University Knight Lab. RT) New MMLC social media channels! The MMLC is finally on Facebook and Twitter! 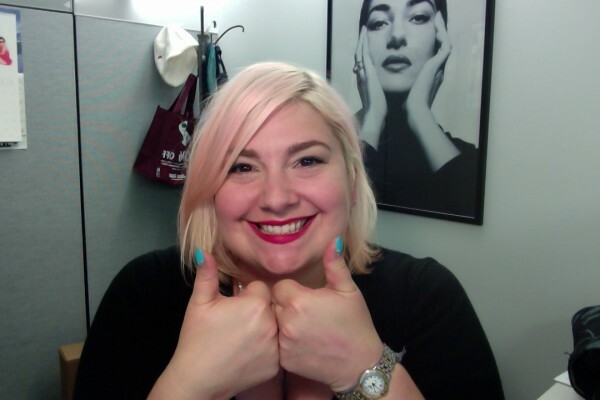 A quick introduction first: I am on the MMLC student staff as the department’s first copywriter in more than 12 years. I write for the blog, but now I also manage the center’s social networking accounts. Back in high school, I wrote and designed for the yearbook, the literary magazine, and the MUN conference magazine. Aside from that, I was also a PR intern at a fashion company this past summer, so I learned a thing or two about getting the word out. I am a fan of tangible media—film, records, old books—and all tools of communication. I suppose this is why people mistake me for a journalism or communications student almost 80% of the time (I am in Weinberg and undecided). I am also a fan of EXO, and trust me, that is very relevant, and I will explain why. For the last year or so, I’ve been leading a double life (cue exciting spy-movie music). Oh yes. Working at the illustrious MMLC is great, but I’ve felt compelled to broaden my mind and explore new educational adventures. So last Fall I bid adieu to what little free time I had and started taking classes for a Speech Pathology degree. My last five classes were entirely online (both in Blackboard and Canvas), and my experiences have given me some insight as to what works and what doesn’t. So whether you’re incorporating Canvas into your classroom-based course or teaching entirely online, here are some observations and suggestions to help your students get the most out of your class.